Ford is now offering different versions of its Transit minibus van. Models range in seating capacity and engine options and can also be customized to suit any taste. The Ford Transit minibus van comes in twelve, fifteen and seventeen seater models. It may be a mere adaptation of the standard size ranges, but at least it still offers a good number of choices for customers. Safety features on the Ford Transit minibus van can include a passenger-assist grab handle on the side and rear doors, no-slip passenger steps and lights to illuminate those steps. This can help to avoid accidents when boarding or alighting from the minibus van. Ford Transit minibus van customers can opt to go for a diesel-powered engine which can handle either 2.0 or 2.4 litres of turbo diesel. There is also a choice between TDdi or TDCi engine technology. Ford describes its TDdi engine technology as, fundamentally, a conventional turbocharged diesel engine while the TDCi engine technology is said to be of a more advanced configuration. Ford has always geared its technologies towards driving down the cost of ownership while balancing it out with better fuel economy and lower maintenance costs. The standard features of the Ford Transit minibus van include what is called a “Safeguard” passive anti-theft system, as well as high security locks. They’ve got a good ventilation system with easy-to-use controls. The ventilation windows are installed high up the dashboard panel to allow more room for the audio system. There’s even a drink holder and a mobile phone stand. 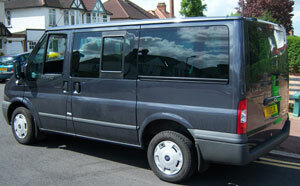 This same minibus van model is described as being easy to handle and it holds the road well. This is easily attributed to its standard ABS braking system and the traction control on the more powerful 2.4 litre models. The interior design of a Ford Transit minibus van has a uniform utilitarian look. Don’t get fooled by its simplicity though. After all, it is tough, durable and it more than serves its purpose. The Ford minibus van is put together in this fashion to ensure that it would not easily come apart at every seam whenever it is subjected to rough treatment, prolonged use and extreme weather conditions. Admittedly the exterior design of a Ford Transit minibus van is not something that one can easily describe as eye-popping by any conventional standards. Still, it sports a sleek, sloped front end giving it a sporty image while at the same time pumping up the aerodynamics of this minibus van model. It’s also got a pretty high roofline to give lots of headroom to the passengers it carries. Moreover, the Ford Transit minibus van is also equipped with a wheelbase that is well set and easily balances the tires well. All in all, this minibus van model might not be a beauty but one will know its value right after getting behind the wheel. It has quality and durability, plus the ability to take one to places with more comfort than many of the other minibus van models available on the market.